Anyone who spends a lot of time working in the garage knows it can become uncomfortably hot in the summer, especially here in Texas. Not only does this affect how you feel while you work in the garage, but many of the items that are stored out there, such as paint, collectible items and metal tools, are recommended to be stored in cooler temperatures than you are likely storing them in. Depending on where you live, the temperature in your garage may be hotter than recommended, or desired. Because of this, we often get asked if it’s possible to put an air conditioner in the garage, or if it’s even safe to do so. The short answer is — Yes you can. And yes, it’s safe if done correctly. However, just because you can doesn’t necessarily mean you should. There’s a few reasons for this, which we will go into detail down below. Even though we don’t necessarily feel that this is the wisest use of an A/C unit, here are the options that you have to cool your garage and how to do so as efficiently as possible. If you chose to put an air conditioner in the garage, you should strongly consider adding some sort of insulation. Whether you add it within the walls or on the garage door itself, without insulation the air conditioner will essentially be ineffective. Or, perhaps the more accurate way to describe it, is a feeble and inept waste of energy and money. This is because the cool air from your A/C unit will simply escape through the garage door or uninsulated walls and the temperature will only stay at a comfortable level for a very short period of time. This will ultimately lead to your air conditioning unit working harder than it should, which will do nothing more than raise your utility bills and shorten the lifespan of the unit. 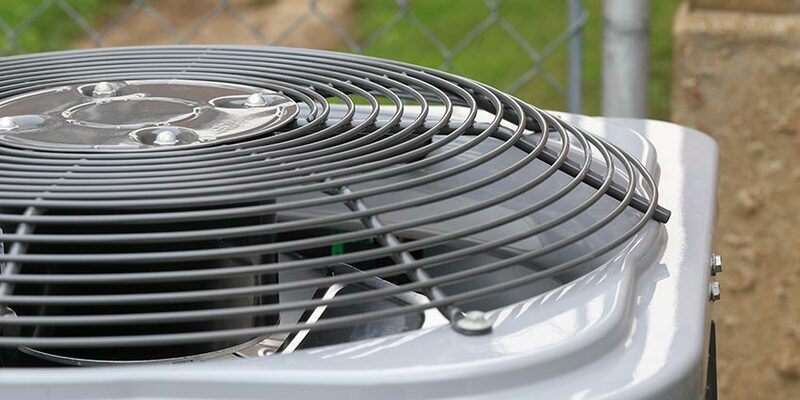 Before we get into the various types of air conditioners to help you cool off your garage, here are three things you should keep in mind when buying an A/C unit for that space. You’ll need to pick a place to vent your air conditioner – you can use an exterior wall, the garage door, or small glass windows. Or maybe you’re just one of those lucky folks that has a full-sized window in the garage. If you don’t have an area to vent it properly, you will need to consider installing the vent in an exterior wall, which will likely require you to cut a small hole in the wall. Whatever option you choose, venting the air conditioning unit is necessary while it’s running, because the hot air that gets released needs to have somewhere to go, otherwise it will just go through the unit and right back into your garage. This will trump your efforts to cool the area. 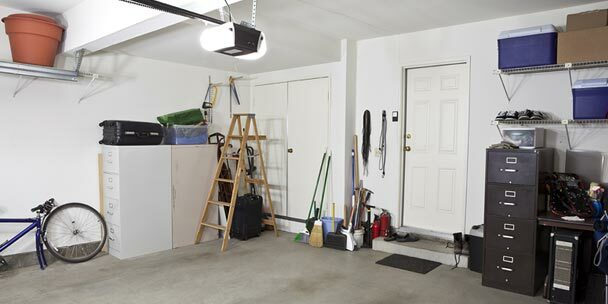 With a properly installed vent, the hot air can travel directly from the unit, through the vent and out of the garage. It’s also important to select an air conditioning unit that is large enough to provide enough cool air for your entire garage. You will need to determine the square footage and then compare it with the BTU rating of the unit. A higher BTU rating means that the unit will be able to eliminate more hot air from a larger space in a shorter amount of time. To help you figure out how many BTU’s you’ll need for your garage, you can use our Cooling Capacity Calculator. 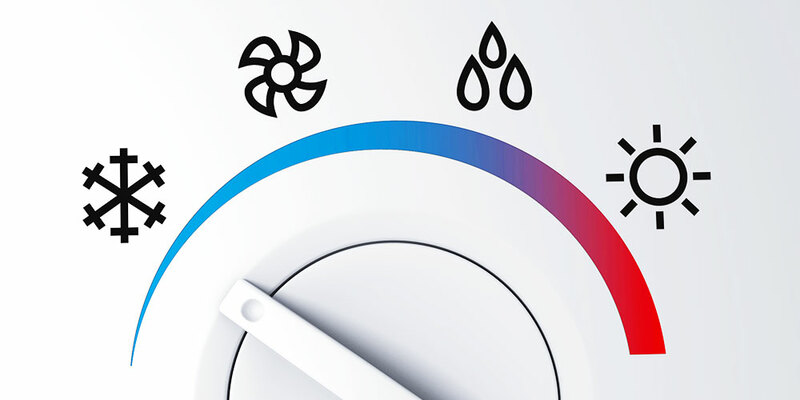 Because most garages have lots of open space, little-to-no insulation and high temperatures, you should consider buying an A/C unit with a higher BTU rating than you initially think you need. This will allow the air to cool faster, and put less strain on the unit itself. It won’t be the silver bullet to cooling a garage, but it will certainly help. While they have a higher initial cost, commercial A/C units are made with rugged, heavy-duty and sturdy materials. These units are specifically designed for warehouses and factories, where an air conditioner is not necessarily feasible or cost-effective. These units may be your best bet at cooling a hot environment, such as a garage. Is A Garage Air Conditioner Worth It? Obviously, the answer to this question will vary from garage to garage, and person to person. For many people, it may simply not be worth the time, money and effort to install an air conditioner in the garage. For others, this may be a life-saver that makes your day-to-day more comfortable. How hot does it get where you live? How many hours do you plan on spending in the garage each day? How many months will you have to deal with the warm weather? If the temperature outside often gets extreme in your area and you plan on spending a lot of time in your garage, it may be worth the effort to install some type of cooling device in your garage. If you don’t spend much time out there, it may be easier to just get a simple fan to keep the air circulating around you. At this point, let’s assume you’ve decided that it is worth installing an air conditioner in your garage. Now, it starts to get interesting. There are many different types of air conditioners and they all have their pros and cons, and the fact that it’s going in your garage only makes this decision more complicated. 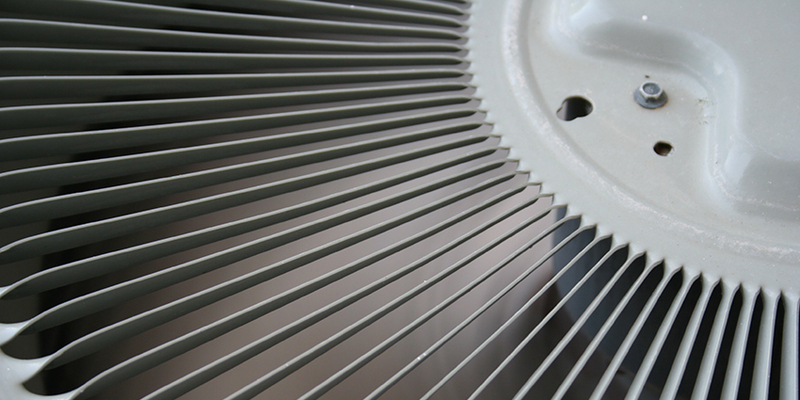 If you have a window in your garage, this type of air conditioner may be your best option. This is especially true if you have a smaller garage. Window air conditioning units are usually inexpensive and easy to install. They have directional louvres allowing you to direct the cool air to the specific area you will be working in. 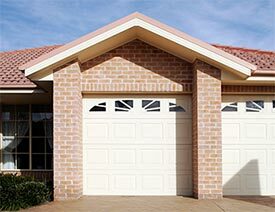 While these units are bulky and possibly somewhat noisy, they are an affordable, quick option for cooling small garages. Once you have the window A/C installed, you can safely shut the garage door, turn the unit on and allow the unit to do it’s thing. You will start to feel the temperature drop to a more comfortable level pretty quickly. In order to avoid wasting money and energy, it’s wise for portable air conditioners to meet certain conditions and be installed properly. We would not recommend using one in your garage at times when the temperature goes above 90°, especially if your garage is not properly insulated. 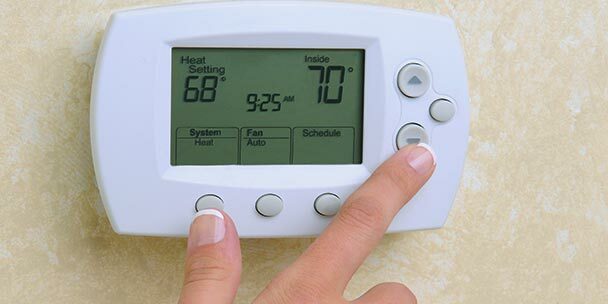 It will merely provide short-term relief and over-work your A/C unit causing it to burn out quickly. While portable air conditioners are great for indoor and residential use, they may not be the best option for the garage. It all really depends on whether you have a way to properly vent the unit. If you don’t have a window that can easily vent the unit, you will need to consider installing a vent in an exterior wall. This will likely require you to cut a hole in the wall. 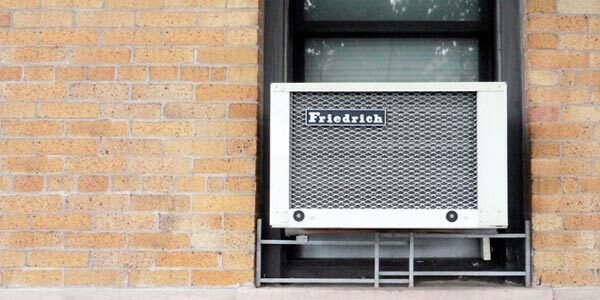 If you have to go to these lengths, it may just be best to install a thru-the-wall air conditioner, as they are usually cheaper and don’t take up floor space. 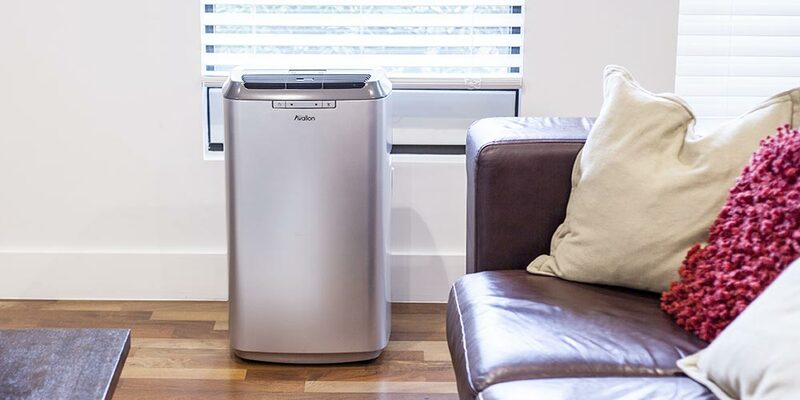 Portable air conditioners have the ability to lower your energy use and save you money. But, if your garage doesn’t have a spot to install a vent for the device, it’s hard to recommend one of these for the garage. Especially if it’s not properly insulated. 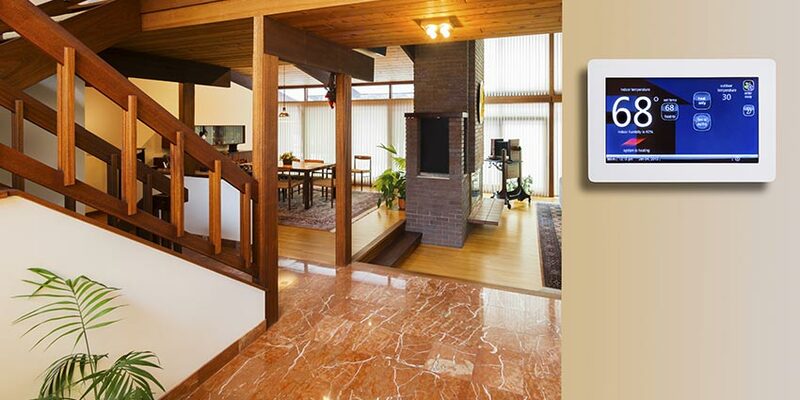 A mini-split air conditioner is another cooling option worth considering. 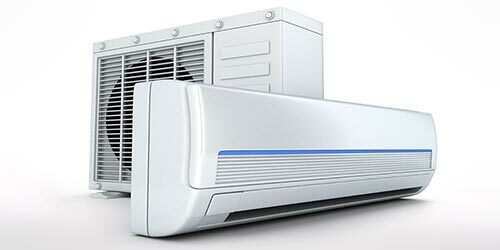 As the name suggests, this type of air conditioner is split between the inside and outside. They are appealing as a garage air conditioner because they don’t require ducts and are known to be extremely energy efficient. They are also mounted high up on the wall, allowing your floor space to be preserved. 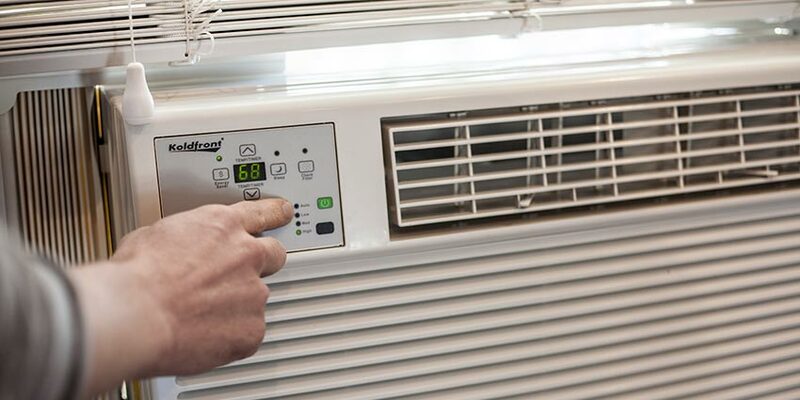 The main downsides of mini-split air conditioners is that they are more expensive to buy, an also need to be installed by a certified HVAC professional. These two factors may be a deal-breaker for you. Not only do they drive up the overall costs, but you will still need to insulate the walls and garage door to get the true efficiency and savings these air conditioners offer. When all is said and done, it may not be worth the time, money and effort that goes into installing a mini split in your garage. If you work out there every single day, then maybe it’s the best option. Otherwise, the initial cost may prove to be too high to justify the purchase. The unexpected cooling solution for your garage, actually isn’t a cooling solution at all. Sometimes, the high humidity levels of a garage makes it feel hotter than it really is, which is why a dehumidifier is a great option to consider. Using a dehumidifier can help remove moisture from the air, leaving your garage feeling cool and dry. While they don’t lower the actual temperature, but can feel 5 to 10 degrees cooler because the relative humidity is reduced. They are cost effective, portable, and impermanent solutions for a hot garage. Another benefit of using a dehumidifier in the garage, is that they can be used in conjunction with one of the other cooling options mentioned above. Some air conditioners even come with dehumidifying capabilities installed as a feature. This is something to consider when deciding on whether or not you need to cool your space. Can you cool your garage with an air conditioner? Yes. Should you? Depends on your situation. If you decide you want to use an air conditioner in your garage, we would recommend you also go out of your way to make your garage as energy efficient as possible. Otherwise, you will just be throwing money away. 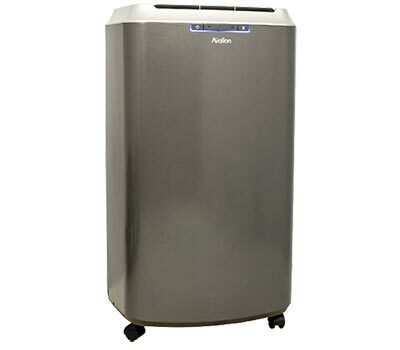 Dehumidifier? to cool? WRONG!!! It uses HEAT to dry the air, you will lower the humidity but you will also raise the temperature. Incorrect. 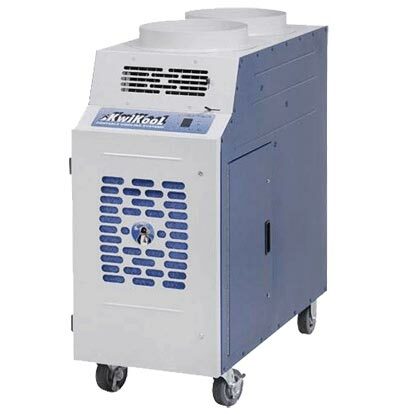 While they do generate some heat, Room dehumidifiers work much like air conditioners; warmer, moist air enters the dehumidifier and then crosses refrigerant cooled coils, causing the moisture in the air to condense on coils within the machine. You are absolutely correct. I have a dehumidifier in my garage. It is great in winter, when it both dehumidifies and adds heat, but in summer, when it is most needed, it also adds heat to an already too-warm garage. I will soon have a mini-split system installed and that should be the best solution. Overall a great article. But……in the options you failed to mention commercial ac units. No biggie i’ll do a little homework……. dude, the third option was a commercial ac unit. You clearly did not read. What wasn’t covered is what you should do BEFORE even looking at an AC system. Definitely insulate your garage door, especially if it is an East facing door like mine. I insulated mine with foam board cut to slot into the panels of the door. If you don’t do this, your door is effectively a huge hot radiator sending heat from the sun directly into your garage. Also, put a reflective barrier on the underside of your roof (Atticfoil.com – that’s where I went). Again, your hot roof becomes a radiator sending heat into the attic to heat up your insulation and ceiling drywall that then radiates the heat into your garage. The foil barrier bounces the heat back out so that it doesn’t heat the attic. This is very cost effective and has made our garage habitable as compared to the hell hole it was during summer months. I actually think attic insulation might be the least effective barrier to external heat, but if you are going to put in an AC system, then the insulation will “keep in the cool” as opposed to keeping out the heat. I am looking at an AC in conjunction with a fan to make the garage usable for physical activities in the heat of a Florida summer. I would probably live with it taking down the temperature a few degrees. The other measure is to disconnect the door opener so your kids/wife stop casually opening the door in summer and causing the temp to jump 10 degrees. The other thing would be WHEN you want to cool your garage. Trying to keep it cool in the middle of the day with heat flowing into it from the sun might be a losing game. Cooling it late in the day with the sun setting or after dark would be a different deal. We want to store some of our books in the garage & are thinking of building a small shed that will sit inside the garage. We’ll use a window AC, but only for the the shed. Do you see any problems with ventilation, etc. w/this plan? 2.A good ac unit correctly sized to your space. 3. Use correct ventilation when showering or in high humidity areas of your home. 4. Shade trees or window treatments to help keep radiant heat from the sun away from your home. 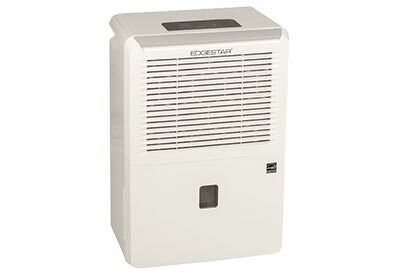 Adding a dehumidifier is a good idea. Mount it high on the wall and add a drain line to the outside so you don’t have to empty the pan. I have a small 10×16 fully insulated (minus barn style doors) shed. I am using it as an art studio which means I have lots of paints and such which can not withstand the extreme heat or cold. I live in eastern NC where it is very humid and hot during the summer months and gets pretty cold at times during the winter months. What would be my best options for keeping the temperature at a somewhat constant, yet comfortable level while protecting my paints? I want to cool a detached 2 car garage with no windows. Only a garage doo and walk though doo with screen. I want to able to put my outside cat up at night for safety reasons but he garage is too hot. This article explained the range of possibilities and the potential problems but seemed to me to be more pessimistic then warranted. To the point if you are handy and willing to plan and work slow your garage, even in central Texas, can be cool and dry all year long. Mine is. What I did was buy three things. An insulated garage door, $2000 or so. An LG mini split sized to handle 120% of my square footage, $950. Four hours of an AC professionals time, $350. That’s about $3250. Water those costs, I spent at least twenty hours of sweat time installing the outside unit and inside unit and drilling a hole in my garage wall, and putting in a 30 amp dedicated service. Beyond all my time it cost about $300 for the breaker and miscellaneous parts. So I’m now at $3550. It’s all done. It works great. My garage is between 68 and 75 degrees all year long. It’s been two years now. My electric bill has hardly budged. That’s my biggest surprise. I’m guessing it adds no more than ten to fifteen bucks a month to my bill. Also in at $3500. Over fifteen years thats going to be well worth it. I LOVE MY COOL GARAGE. Dang, that’s a great idea Betty! I mean why would anyone use a garage to work on their car, do woodworking, or any other projects. That should definitely be done in a room inside the house in an extra room. I’m sure the resale value wouldn’t be any higher. What kind of guy would want an air-conditioned garage? Jeff, Nicely done. Good article and timely for me as well. I live in Austin so very familiar with summer heat in the garage. I’m also looking at tapping into my home a/c ductwork to add a vent in the garage. It wouldn’t be that difficult since our current a/c unit has the capacity for cooling a few more square feet and the exchanger was conveniently installed in the garage closet. Cost of the install is minimal, probably less than $50 for the vent, a few feet of ducting and my time. If this doesn’t work, I’ll be looking more seriously at a ductless system. @Richard – Have you found a solution? We live in Austin as well. We are looking for a solution to air condition our garage. I was thinking of tapping into current ac exhaust just like you mentioned. Interested in seeing what you have come up with. We are moving 2 of our classic cars with us back to FL and want to provide the best way to keep the rust “monster” from eating them alive as I store them in our garage. Lots of dehumidifier and A/C talk, but would love some input. do it its a great idea!, I found a 9000 btu minisplit on ebay sharkaire for right around $600 that is preloaded with r412. its good for a 2 car garage. borrow a vaccuum pump to install yourself. easy. add bout $400 of r19 insulation in attic. and if your garage door is not insulate get the foam perma frost board from homedepot or like 8 bucks a sheet cut and put in the panels to block the radiant heat. i also added plastic floor tiles there $2 a tile free shipping on ebay from speedway to insulate when its cold. Before going the easy route with a window unit or portable a/c unitthink about security. 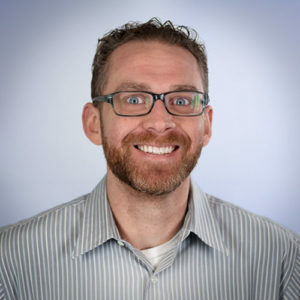 One of the main benefits of mini split is that is does NOT compromse security. Good article but one of the things that’s most important when cooling a huge area like a garage is the COST of running it. You DEFINITELY want a unit that runs on 230 volts and not 115. It will use HALF the amps and therefore cost u half as much. Plus usually your electric panel is usually close by so it’s easy to get wired up. They make most larger ac units in 240 volts. The split system would probably be the best for the money if u can afford it. Just make sure you figure out your square feet and be generous. They are not well insulated usually and have higher ceilings. In theory the idea 240 V being 50% cheaper sounds great, but is incorrect. Your meter doesn’t keep track of amps (or volts) used, electricity usage is measured in KWh (kilowatt hours). Simply put, say your toaster is rated to use 1200 watts of electricity. It doesn’t matter if you have a 120V or a 240V toaster, the wattage will be the same, but the amps used will be different as you stated (watts÷voltage=amperage ohm’s law), but that will not affect your bill. Hope that helps, cheers all! so the reason I stumbled on this article was the Movie Fanboys a big time star wars spoof one of my favorites. In the movie Hutch who drives the really cool van that only plays Rush, Hutch lives in his parents garage or as he calls it a carriage house but its really a garage. he has it set up like an apartment I don’t even want to know what he uses for a shower but may be he uses a mini fridge, Microwave, and hot plate. but I always wondered does he use an Air Conditioner or heater in the winter he lives in Ohio? what do you guys think?